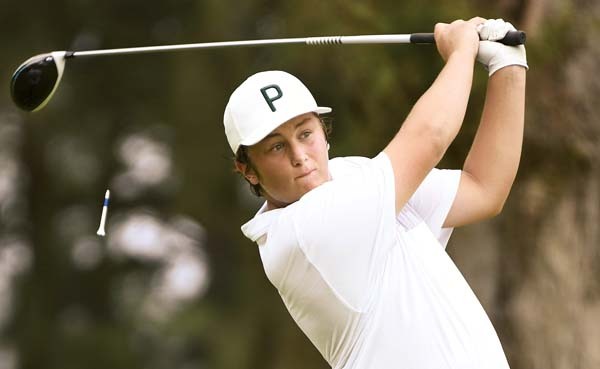 WAIEHU — Chad Lee has been waiting for Saturday’s first round of the Maui Interscholastic League individual golf championships for a while, in more ways than one. 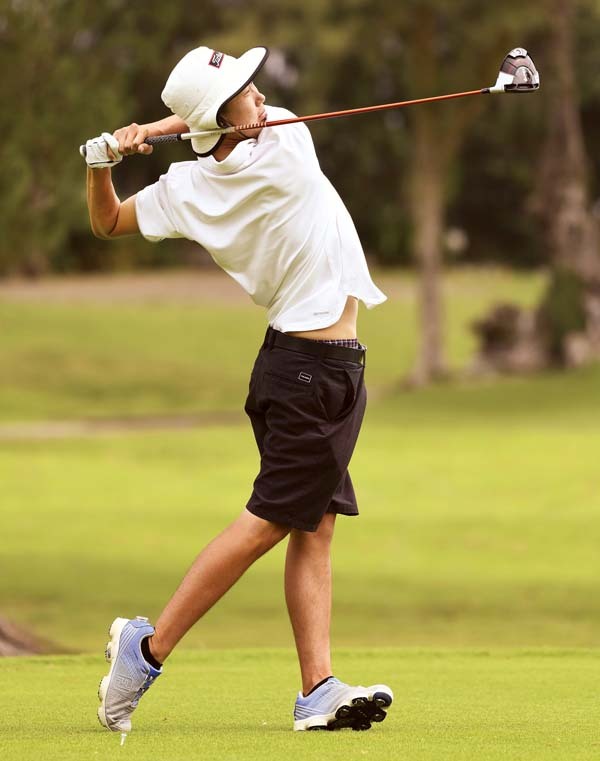 The St. Anthony High School senior made the most of his first competitive action since January — and first high school action since last season’s state tournament — with a 5-under-par 67 at Waiehu Municipal Golf Course to take the lead in the boys event by seven strokes. 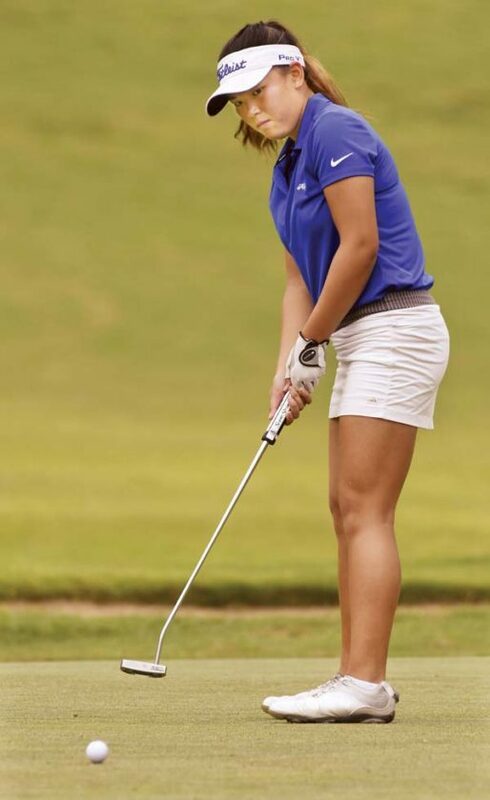 Defending MIL champion and state runner-up Reese Guzman, a Maui High junior, shot 70 and leads the girls MIL tournament by eight strokes. Reese Guzman of Maui High rolls in a birdie putt on No. 3. Lee recorded birdies on 1, 4, 5, 7, 9, 12, 15 and 17. He bogeyed 8, 10 and 16. 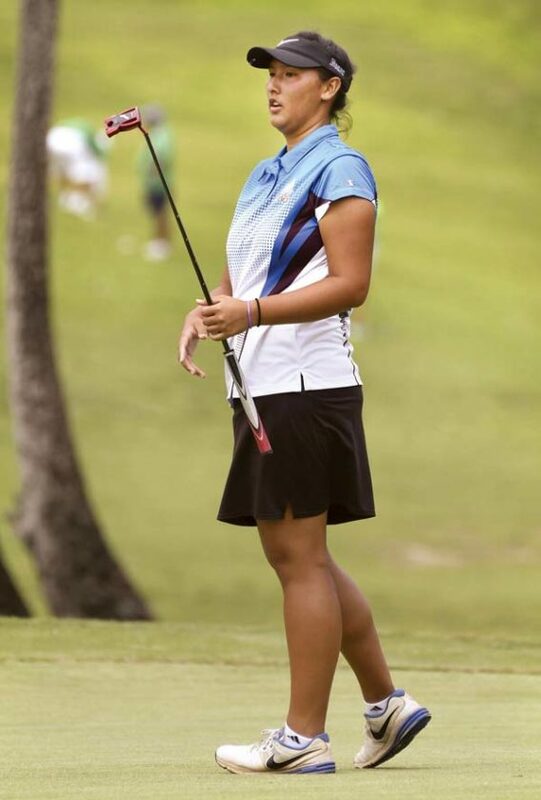 Lee leads Maui High senior Jordan Terada by seven strokes. Lee, whose last competitive round was pre-qualifying for the PGA Tour’s Sony Open on Oahu, has been sixth, fourth and second in his first three MIL individual tournaments. Maui Prep’s Hudson Holland tees off on the fourth hole Saturday. Lee finished tied for 16th at state last year, while Terada was the top MIL finisher, in fifth. The pair played together Saturday in the first group of the day. Terada is not about to surrender the title to Lee, his good friend who was at the Sabers’ senior day in the team competition a couple weeks ago with shaving cream to spray on his buddy. “That’s the good part of having three more rounds, it gives me time to get those strokes back,” said Terada, who has signed with St. Martin’s University to continue his career. The next three rounds are at Pukalani Country Club, The Dunes at Maui Lani and Kapalua Bay. Baldwin’s Lana Calibuso-Kwee watches her birdie try on No. 3 — she settled for par. In numbers updated by the state association this week, the MIL gets 16 slots to the boys state tournament and nine to the girls event. As MIL team champions, the Seabury Hall boys already own five slots and the Baldwin girls have four. Seabury Hall freshman Summer Wong stands second to Guzman after a 78.